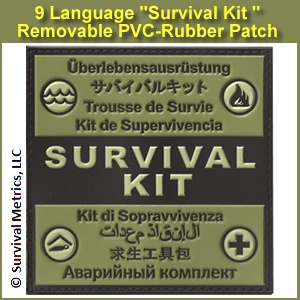 The Escape & Evade Mountain Military Survival Kit (VM) is designed with the survival and medical concerns of the mountain warrior, or any service member operating in cold climates. 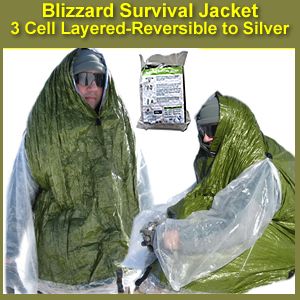 At the center of the survival kit is the Blizzard Survival Jacket: a triple cell layered core insulator that also grants insulating head cover, and also covers the arms for wind and rain protection. Extra long fit means that the individual can retain body heat from the majority of the body area. The jacket is wind and waterproof, and while small and compact, it expands to open the ReflexCell material to trap air for maximum heat retention. 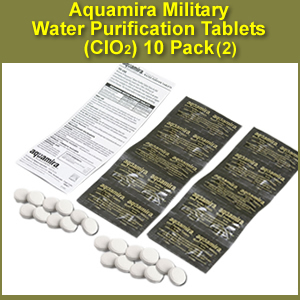 Fire building, signaling, water collection and purification, navigation, and many survival tools compose the kit. 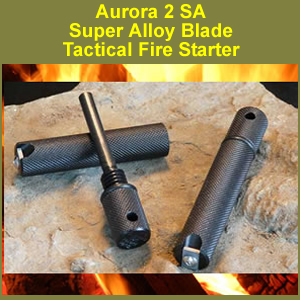 A GRIP-S survival tool is also included, which allows the user to incorporate other tools, such as a SAWZALL blade, into the kit, for maximum survival tool use. Fire building is an essential component of cold weather survival, and can be done tactically by using certain methods, such as a Dakota hole. 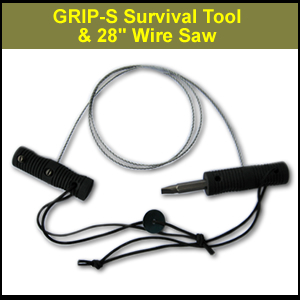 The GRIP-S Survival Tool is included in this kit to provide the best compact wire saw to make this task easier, with its sure grip handles and 28 inch length, it makes quick work of wood for fire and shelter building. The medical components allow for treatment of traumatic wounds, and for creating splints for injured limbs; a typical mountain injury. 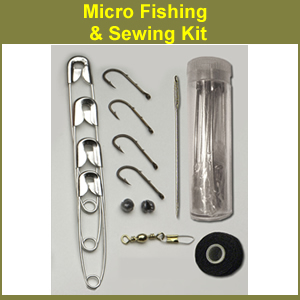 View Comparison Chart of All Escape & Evade Series Kits Here. A thermal core insulating jacket to prevent or treat hytpothermia. Thigh-length, 3 cell, with hood, made from ReflexCell (tm) material. Enables insulation while remaining mobile. 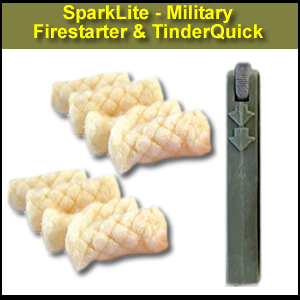 Designed for use in cold environments. Warmth: 8 Togs (thermal resistance): equal to a quilted jacket. Can be stored indefinitely. Not affected by temperature or moisture. Re-usable: jackets can be re-used many times without loss of performance. Tactical outer olive drab, reversible to silver for signaling and high visibility. Size: (packed): 4.5 in. x 6 in. 1.75 in. (unpacked): 1.15 meters (3.77 feet) - one size fits all. Quantity: (2) packs of 10 tablets. 1/4 in. diameter (.635cm) composite flint steel rod that has magnesium built into it. Super Alloy Lifetime Striking Blade that will not dull: Tungsten, Carbide, Cobalt alloy. Built-in blade will not get caught on equipment, or rattle in combat. Housing machined from solid lightweight aerospace aluminum. Knurled for grip. Lanyard hole. O-ring seal: waterproof. Functions wet or dry. Length: 3.6 in. Diameter: 0.625 in. Weight: 2 oz. 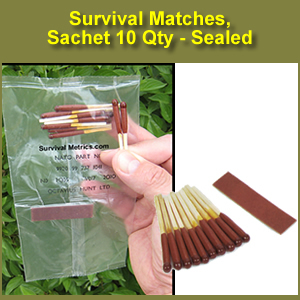 Vacuum sealed sachet of 10 matches with striker board. 10 to 12 second burn time each. 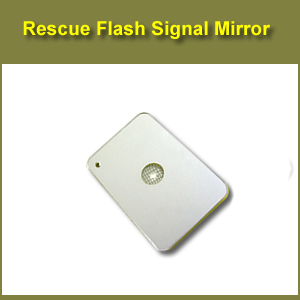 Issued to British military forces and lifeboat systems world wide. NATO approved: NATO # 9920-00-966-9432. Quantity: (1) sachet of 10. 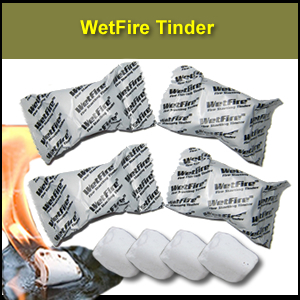 Comes with (12) Tinder Quick Fire Tabs (1-2 min burn time each). Zip pouch included with instructions. 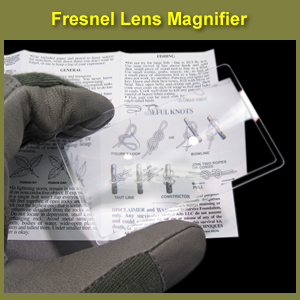 A flat magnifying lens, 2 in. x 3 in. Used to start fires using the sun, and to read small print, especially if glasses are lost. 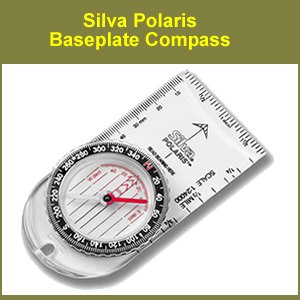 A slim profile, highly accurate and durable baseplate compass. Clear base plate with inch, millimeter and 1:24,000 scales. Liquid filled, with tungsten steel needle, lanyard hole, and friction free sapphire bearing. 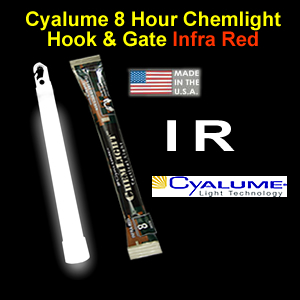 Made in the USA by Cyalume. 12 plus hour burn time at max (more if power conserved). The combat proven hemostatic agent that stops traumatic bleeding. 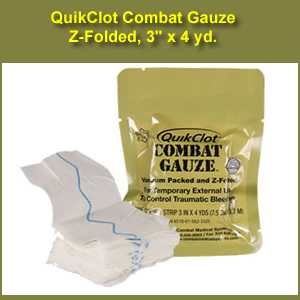 Advanced hemostatic agent combined with the simplicity of gauze. Z-Fold Vacuum Packed for easy application. Packaged in 3 in. x 4 yd lengths. Can be fitted to any size or shape wound. Easily removed once clotting occurs. Recommended by Committee on Tactical Combat Casualty Care. 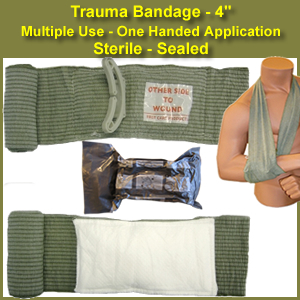 An all-in-one bandage that consolidates multiple first-aid devices such as a primary dressing, pressure applicator, secondary dressing, and a foolproof closure bar to secure the bandage in place. Secure, water-resistant pressure applicator and closure bar. Immediate direct pressure: The pressure clip creates direct pressure applied to the wound. Can also be used to aid splinting. 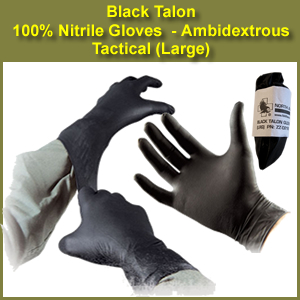 100% nitrile gloves free of the allergens found in standard latex gloves. Engineered to give users high performance by offering both maximum protection and unsurpassed tactile sensitivity. Form fitting , individually wrapped pair for convenient rapid deployment. Textured for improved wet and dry gripping. Longer and thicker than standard examination gloves. Extended, beaded cuff for quick and easy donning. Size: Large (will fit most users). 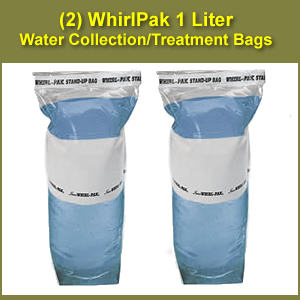 Uses include first aid protection, prevention of contamination when skinning game, and more. 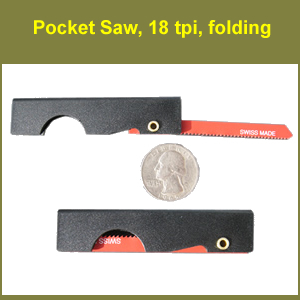 Much more than a 28 inch wire saw, this tool is a specialized piece of survival gear that allows you the ability to use any universal shank saw blades (increasing your capability to cut and fabricate beyond wood including dense plastics, various metals, and even masonry and stone), and any round or hexagonal tools up to a quarter inch in diameter (including standard hex bits, metal files, drill bits, awls, etc.). Two Universal Handles separate with the attached hardened metal driver disc to allow not only positive grip wire saw handles, but also to install virtually any tool you see fit; from reciprocating saw blades like SAWZALL blades to cut metals, wood, and more, to specific tools like prying tools, drivers, awls and drills. 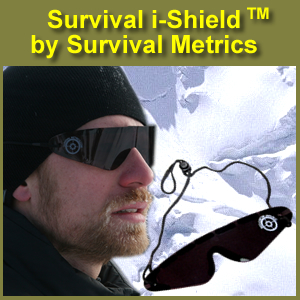 Designed for protection of the eyes in emergency and survival situations where the risk of snow or sun blindness is high. 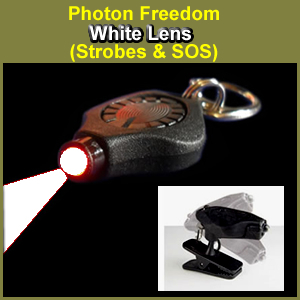 Restricts 99% of UVA and UVB light. Polarized. No arms that can break. 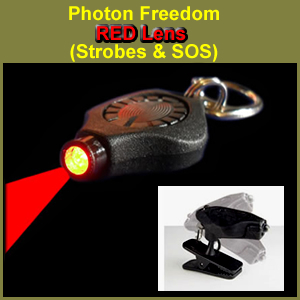 Wrap around lenses give maximum protection from all angles. Foam pads aid to prevent fogging and for comfort. Drawcord for secure, comfortable wearing and ensured retention. 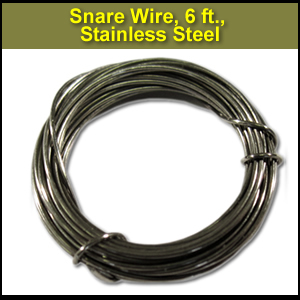 Snare Wire, Stainless Steel, 6 feet. Mil-spec grade, stronger than brass. Used to create snares, repairs, and more. 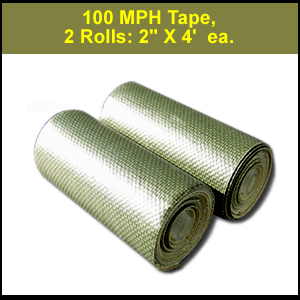 Quantity: (2) rolls, 2 in. x 4 foot each in zip pouch. 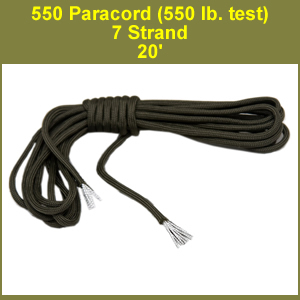 Genuine high grade parachute cord issued to U.S. Military forces. 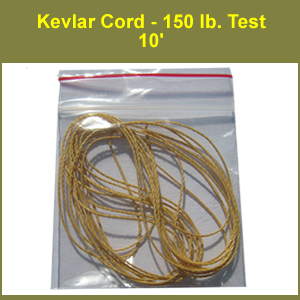 7 inner nylon cord strands, plus the shell, equals 160 feet of high quality nylon cord for use to make shelters, fishing lines, snares, and many more survival items. 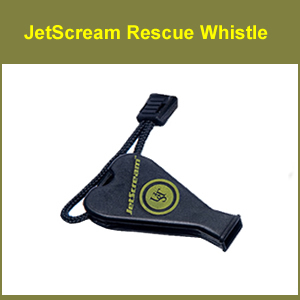 Used for first aid tasks, cord cutting, food preparation and more. 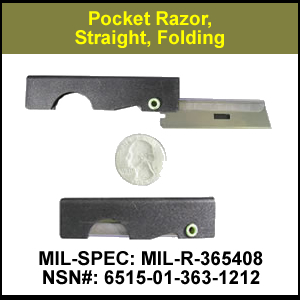 Pocket Razor, Straight, Folding, 2 inch. 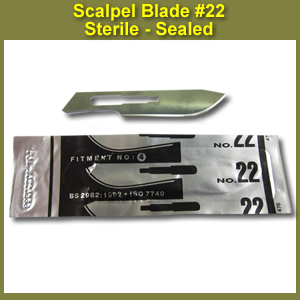 Issued to U.S. military forces: for use as a micro knife for medical and other applications. 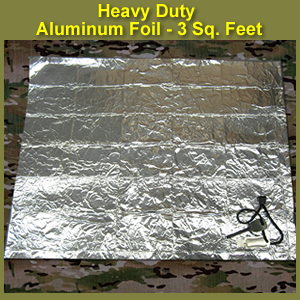 Aluminum Foil, Heavy Duty, 3 square feet. Used to form container to boil water, cook, reflect fire heat, signaling, and much more. 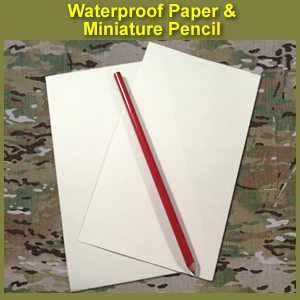 (2) Sheets of waterproof paper, 2 in. x 3.5 in. Useful to leave notes, create small map of snares, and more. Miniature pencil is easily sharpened. 200 Denier Silicone Impregnated Ripstop Nylon Rand and Backing / 1.1 oz Silicone Impregnated Rip-Stop Nylon Front Panel. Waterproof Zipper with silent pull tab. (2) 3/4 in. Snap Clips to close cover in case of zipper failure. 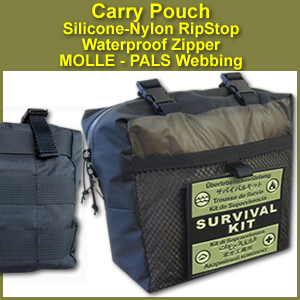 MOLLE/PALS webbing for attachment to equipment. Kit weight: 2 lbs 2 oz.